When I'm on a tight budget, I'm always looking for delicious but inexpensive recipes to make. This one was a winner! I found it on one of the Russian cooking forums but it originally came from the book "Grandma`s Best Recipes" (not sure which one. I found quite a few different ones online). I had all of the ingredients on hand, and it turned out so good that, I thought, I would share it with you. Yum! 1. Preheat oven to 350 degrees F. Separate cauliflower head into florets. 2. Place cauliflower in a steamer over 1 inch of boiling water, cover and cook until tender but still firm, for 5-7 min. Drain and pat dry with a towel. 3. While your florets are cooking, in a separate pot melt butter and add flour. Cook on low heat for 1 minute stirring constantly. 4. Take it off the heat and add milk gradually while mixing it all together to avoid lumps. 5. Bring the mixture back to boil and cook on low for 2-3 minutes or until thickens. Again, you need to stir it all the time. 6. Mix in cheese, nutmeg and pepper. Once cheese is melted, check if it needs more salt (to taste). 7. Place cauliflower in casserole dish; gently stir in cheesy sauce. Sprinkle with some cheese on top (can also add bread or cracker crumbs for extra crunch) and cook for about 10 minutes or until heated through and bubbly. 8. Serve with rice or quinoa. Enjoy! I love cauliflower cheese but I make it with soya milk and lactose free cheese. Tastes just as good as the dairy version (no complaints from hubby) I've been shopping in a different store lately and found some lactose free soft cheese. your chicken and rice soup will be on the menu soon. Oh, please, let me know how the soup will taste with soy milk. Now I wish I had a head of cauliflower around. This basic cheese sauce should work for most vegetables, though. I haven't tried it on anything else yet but, I think, it would be great on other veggies. 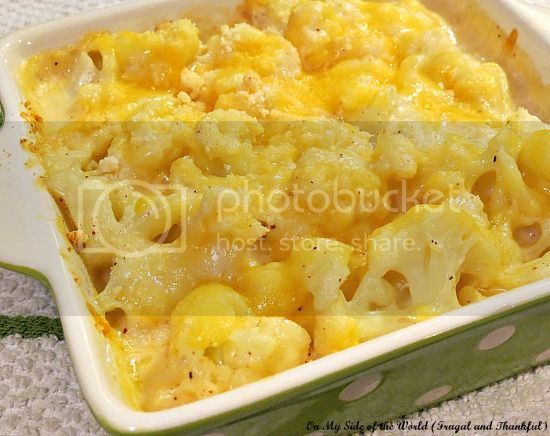 Oh my gosh, this is like mac and cheese only with cauliflower! I just bought a bag of cauliflower florets and was trying to think of what to do with them. It's going to make the perfect lunch! :)! Thanks Lena! Oh, yum. That looks very good! Indeed, I thought I was looking at mc'n'cheese on a first look. YUM! I love cauliflower and I've heard that it is THE vegetable of 2014. I recently bought two heads and used one already. Wasn't sure what to do with the 2nd one but I do now! Gosh but that looks good! I'd make it tonight but I'm alone and likely would eat it ALL by myself. we eat it with garlic bread as a main meal. That looks delicious! I just cam across your blog and I love it- thank you for all the work you put into it. I am really enjoying reading all your posts! Seems like we've got a lot in common! I will be following, God bless! This looks delicious! I just came across your blog and love it! Thanks so much for sharing with everyone- keep up the good work! This looks wonderful! Such a comforting dish, and I love how nutmeg always adds that extra flavor that makes the dish so delicious! This looks so good!